It is our opinion the Magic Tan VersaSpa model single-handedly turned the indoor tanning industry and UV free sunless tanning business around a few years ago. Right about the time tanning beds were fading and UV free tanning was losing it's appeal due to the cold and wet nature of the experience, Magic Tan produced a very exciting new model called VersaSpa. By incorporating "heaters" to keep the body warm in the cold salons and "dryers" to blow dry your body when the session was competed, they created a fantastic sunless experience. This results in the best sunless tan money can buy and we encourage you to purchase a new one if your budget will allow (they now have the VersaSpa Pro model). 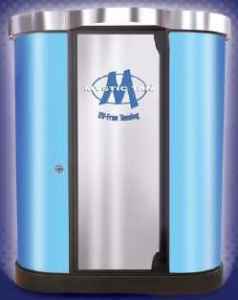 This unit is very unique in that it is a multi-treatment system which also applies UV tanning accelerator, sunless prep, and anti-aging moisturizers. You can read more about the new Magic Tan Versa Spa by visiting their official website or see for yourself exactly how the spray tanning process works by watching a video here. Watch how Versa Spa has set a new standard for the sunless tanning experience. Click here to view our used Magic Tan Versa Spa models for sale on this website. 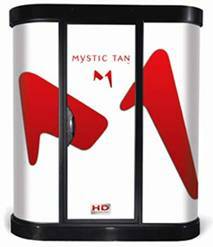 The Mystic Tan HD model is the most recent booth sold under the Mystic Tan brand. This booth features a heater and blow dryer which allows the customer to immediately put their clothes on without threat of staining. Using the same outer shell and personal single use cartridge system as the MyMyst model, Mystic Tan HD added a splash of color and a lot of heat to vastly improve the sunless experience. HD may stand for the "High Definition" series but we think of it as the "heaters and dryers" model. Like the Versa above, this unit now heats the space during the session to allow for maximum skin absorption of the sunless product and provides for full body drying during the application process. The number one customer complaint of the past was their clothes and bed sheets were stained from the application process. Blow drying the customer when they are done has solved this issue. Additional features include MagneTan and Airbrush technology along with the single use cartridge system employed by the MyMyst series below. You can read more about the new Mystic Tan HD sunless booth by visiting their official website or see for yourself exactly how the spray tanning process works by watching a video here. Watch how Mystic Tan has produced a fantastic sunless option for loyal owners and customers. Click here to view our used Mystic Tan HD models for sale on this website. The Mystic Tan MyMyst model is our next favorite to restore because of it' s simple design, cartridge system and engineering behind the technology. The Mystic Tan MyMyst series features a tri-oval shaped booth (think Daytona) consisting of a curved plastic shell with spray nozzles which mist or "fog" the customer with a DHA chemical which interacts with your dead skin layer to turn it brown. The nozzle has a positive charge, similar to a powder coating spray paint gun, so when the formula is shot from the spray nozzle it carries a positive charge and seeks a "ground" through your body, which makes the "mist" attract to every inch of your exposed skin and evenly distributing the "chemical" over your body except where you applied "barrier cream". 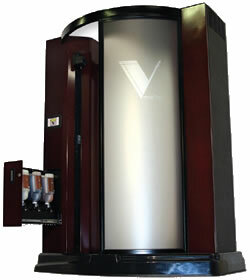 The "cartridge" system replaces the large bladder delivery systems of older models and creates a unique sunless tanning experience for the user. The cartridges are stored behind the counter with the lotions and they are purchased there. The customer then takes the cartridge with them to the room and places it in the receptacle to begin the session. See a video of how this works and view our used Mystic Tan MyMyst models for sale here. The Mystic Tan Innovation MT5000 model can be identified by the silver band around the top. The Innovation is now over 10 years old and contains outdated technology. This particular model had a limited run with very different pump, spray and nozzle technology. Sunless Inc will no longer support or offer parts for the Innovation model, but American Quality MFG in Florida (800-667-9189) will. We also provide a spare parts exchange board for the Innovation MT5000 model on our Spa Talk page. The Innovation model now often sells for less than $5,000 but needs to go to a proper home with an owner who understands pump and nozzle technology and is ready to get their hands dirty. We provide full smartphone tech support and have years of experience with the Innovation model. If you are an Innovation owner we will try to help or upgrade you to newer technology. If you are a first time buyer, please buy something else. The disadvantage of this technology is the process is very cold and almost "shocking" to your body when the blast of mist is released in the booth. They have addressed this problem with the new Mystic Tan HD model which completely dries your body before you exit the booth. Please click here to view the Mystic Tan Innovation we have for sale on this website and watch a cool demonstration video of how it works. 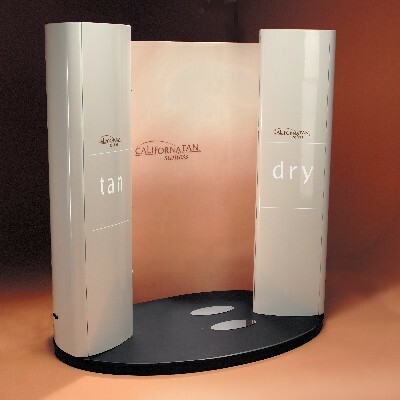 The UV free spray tanning booth pictured here is the California Tan Autobronzer model which introduces a new look and feel as well as different technology in sunless tanning. We are not quite sure they are still in production. There are a few on the secondary market but parts and supplies may be difficult to find. This new look in sunless tanning features an attractive, open-air, non-claustrophobic design with unique, self-cleaning, anti-clog nozzles. Coolest feature is the DRY tower which allows for a full body spray tan and auto dry in less than one minute. Additional features include three choices of tanning levels and voice prompt with easy to follow instructions in four languages including French, English, Spanish, and Italian. This radical new design promotes a stress free sunless tanning experience, which dramatically increases your customer return treatments. Also, the new pump and motor systems provide much more quiet operator friendly systems with minimal overspray and very little equipment cleanup. Click here to view used Cal Tan Autobronzers. 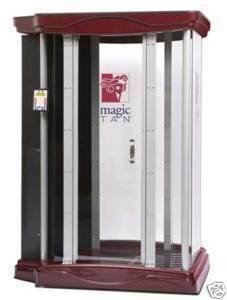 The Magic Tan MT3500 spray tan booth pictured here is the next generation and improved model over the MT3000 model. This Magic Tan model features a 20 second spray time using 27 nozzles, 3 levels of tanning, and a self-cleaning wash down feature. This unit also has optional features which include the voice prompt which tells the user when to turn and LCD diagnostics which allows an engineer to troubleshoot the booth remotely. Some used models also have the optional hand-held air brush attachment for touch up spraying. Keep in mind, most of these units are 15+ years old and require constant attention and use to be functioning properly. The 27 nozzles need constant maintenance to keep clear. Please make sure you have the proper maintenance team ready to tackle this task. Sunless Inc, or American Quality (us) does not support these very old units. However, we provide a forum for owners of used MT3000 and MT3500 sunless booths to exchange parts. 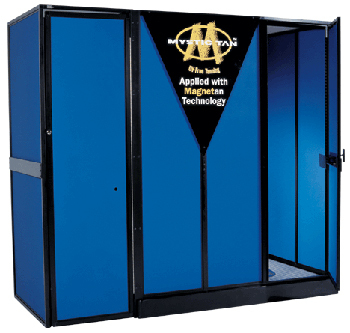 The Mystic Tan Original MT3000 (blue box) model pictured here was the very first Mystic Booth which merely consisted of a plastic shell with spray nozzles which mist or "fog" the customer with a DHA chemical. This DHA then interacts with your dead skin layer to turn it brown. The original model features a 90 second tan, 3 levels of tanning, and self-cleaning feature. There are ton of these on the used market priced today priced from $free to $1,500k. Why? Parts for this Original are hard to find and service is nearly impossible. If you have a guy or gal who is good with pumps and nozzles, this booth may be right for you. Be careful when buying one of these older Blue Box Orignial units and be sure you have a qualified technician nearby if considering owning one. Click here to read more about our used Mystic Tan Original MT3000 "rescue and adoption" program. © Copyright 2008-2017.SprayTanBooth.net All Rights Reserved.